After three years of college in his home town of Quincy, Illinois, Scott Landfield moved to Eugene in 1978. "People were coming out to plant trees," he says. "I planted trees for 20 years." Chicagoan David Rhodes was a student in Berkeley when he hitchhiked to Eugene for a 1984 Grateful Dead concert. "It was a hippie wonderland," he says. "I knew I'd live here one day." After a few years back in Chicago, Rhodes made the trek west in 1993. He played saxophone in several bands and worked days at the Black Sun Bookstore, where he met Landfield, a part-time employee when he wasn't in the woods. 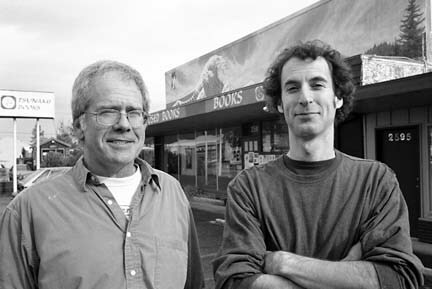 Black Sun owner Peter Ogura helped Rhodes open Tsunami Books in 1995, and Landfield joined the business a year later. More than just a bookstore, Tsunami has become a cultural center, hosting writing classes for adults and kids, literary readings, theater, political events, and concerts. Nearly bankrupt in early 2005, Tsunami was rescued by an impromtu "cabal" of investors. "Mostly poets," Landfield observes . "Now we're a community-owned business. This is the first year we've made a profit."